It’s fall so it is time to start making all sorts of delicious Apple Recipes. I have shared quite a few apple recipes for you here on my blog these past few weeks. Apples and caramels are two of my favorite things and many of these recipes are perfect for my apple addiction. 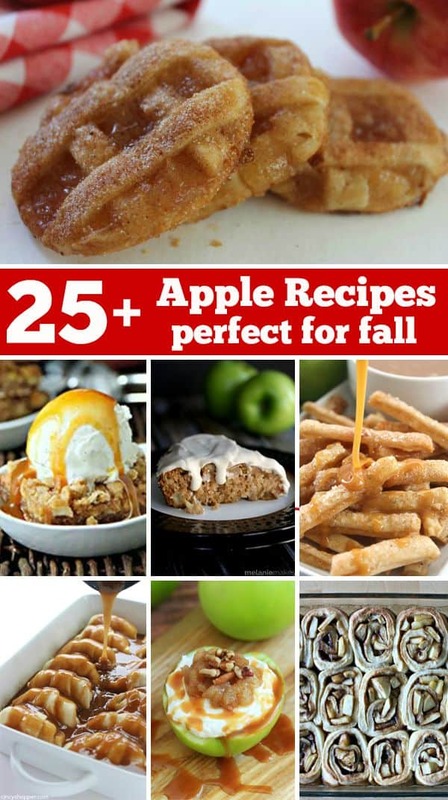 If you are looking to try some great apple recipes this fall, be sure to take a look through this awesome apple round up to give you some ideas. 2. Caramel Apple Pie Cookies – Fall will be here before we know it and these Caramel Apple Pie Cookies will make for a comforting dessert. They resemble a mini apple pie and are super delish. Fun and easy too since they use simple store bought ingredients. Whip them up in just a few minutes time. 3. Apple Skillet Cake with Marscapone Glaze – This Apple Skillet Cake with Marscapone Glaze is full of Fall flavors yet couldn’t be easier to create. 4. Caramel Apple Donuts – These Caramel Apple Donuts will make for a great fall breakfast or dessert. You will find them loaded with great apple, caramels, and nuts. Since they are baked, not fired, they come together quite quickly. 5. Caramel Apple Bars – These Caramel Apple Bars are full of fresh apples, caramel, and oats! 6. Apple Dumplings – This super Easy Apple Dumplings recipe happens to be one of my favorite year round desserts. Since the recipe uses store bought crescent rolls, it comes together quite easily. You will find Mountain Dew as a secret ingredient. The soda adds some additional sugar to the recipe and allows them to bake perfectly. 7. Cheesecake Stuffed Apples – Crisp, tart and sweet, beautiful green Granny Smiths halved and gutted. Generously packed with a creamy, decadent no-bake cheesecake filling. Topped with the Granny Smith insides cooked with cinnamon and a sprinkling of chopped pecans then drizzled with caramel sauce. 8. Caramel Apple Taquitos – These Caramel Apple Taquitos will make for a perfect dessert this fall. Super simple flour tortillas loaded with apple pie filling, cinnamon sugar, and caramel. 9. Quick and Easy Apple Cinnamon Roll – The flavors of cinnamon, brown sugar, apples and warm dough all come together in this recipe for a cinnamon roll that will have your kiddos licking the pan and begging for more. 10. Apple Pie Fries – These super simple Apple Pie Fries make for a super fun spin on a traditional apple pie. Store bought pie crust cut into strips, filled with a simple store bought apple pie filling, then baked for crispiness. You can dip them in caramel sauce or even whipped cream for additional yumminess. 11. Apple Caramel Pie Bars – Apple and Caramel pie filling surrounded by a crumbly cinnamon-oat crust and topping. These bars scream fall without needing any pumpkin. 12. Traditional Apple Crisp – This Traditional Apple Crisp recipe will make for a great family dessert this fall. Apples topped with an oat streusel topping then baked, comfort food at its best. Since this dish requires just a few ingredients, it comes together quickly. 13. Slow Cooked Apple Sauce – I love the “set-and-forget” aspect of this recipe. And stirring is only really necessary at one point in the process. 14. Apple Pie Cupcakes – You will find all the wonderful flavors of an apple pie in these Apple Pie Cupcakes with brown sugar cinnamon frosting. This recipe is super simple since we used a store bought cake mix and also store bought pie filling. 15. Apple Bread Stuffing – A delicious herb stuffing that includes apples. Great for a Thanksgiving side dish. 16. Caramel Apple Cider Cookies – These Caramel Apple Cider Cookies make for a perfect fall cookie. You will find great apple cider flavor and a gooey caramel filling stuffed right in the middle. All the apple flavors packed into one delicious cookie. 17. Cinnamon Apple Chips – One of the easiest apple recipes that you can make. 18. Caramel Apple Poke Cake – This Caramel Apple Poke Cake will make for one amazing fall dessert. The cake is loaded with great cinnamon, apples, and caramel. Perfect for serving at your next fall potluck. 20. Caramel Apple Nachos – These Caramel Apple Nachos are a perfect after school snack or fall treat. Perfect wedges of crisp apples loaded with caramel, nuts, or whatever fixings you choose. They are super simple to whip up in a few minutes time. 21. Caramel Apple Bombs – Who doesn’t love the delicious combination of apples and caramel. I love this recipe for Caramel Apple Bombs because it is a great way to enjoy these flavors and it is very quick and easy to put together. 22. Mini Apple Cheesecakes – These super easy Mini Apple Cheesecakes pack all the yummy flavors of an apple cheesecake in bite sized form. It’s almost fall and these little bites of heaven will make for a great evening dessert. 23. Apple Spice Smoothie – A yummy fall smoothie otherwise known as an Apple Spice Smoothie. 24. Homemade Apple Pie Filling – This traditional Homemade Apple Pie Filling will be perfect for all your fall baking this year. With a few simple ingredients, you can have a pie filling that works for many great fall apple desserts. Great for pies, crisps, cookies, and more! 25. Best Praline Apple Pie – Can you bake a homemade Apple Pie? Yes, you can! You can make the Best Praline Apple Pie with this recipe. The praline sauce baked on top makes this pie. 26. Apple Cinnamon Cream Cheese Bread – If you have yet to try cream cheese stuffed bread, you are going to want to make this Apple Cinnamon Cream Cheese Bread this fall. Yes, this yummy quick bread is stuffed with a yummy cream cheese layer that blends so well with the apples and cinnamon. 27. Apple Cinnamon Oatmeal Cookies – These Apple Cinnamon Oatmeal Cookies make for the perfect fall dessert or even an on the go breakfast. You will find lots of apple and cinnamon flavors. 28. Easy Apple Cinnamon Rolls – If you are needing a quick breakfast or dessert idea, these Easy Apple Cinnamon Rolls with Cream Cheese Icing will be perfect. Since we use store bought crescent sheets, they come together quite quickly. Do you have a favorite apple recipe that you make each fall?